With the 2012 London Olympics fast approaching, Kenya is eyeing a top spot finish on the medals table with individual athletes working hard to gain full fitness ahead of the trials and actual moments in London. Over the years Kenya has recorded below average performance in field events mostly dominated by South and West Africa in the continent and USA on the global front. One of the field event is Discuss, which budding athlete Rose Rakamba has opted to specialize in. The 22 year old athlete started playing discuss back in primary school at a tender age of 14years but had not thought of going national about her newly found talent. However, slowly and gradually her form improved over the years and by the time she was 19 Richard Metet one of Kenya’s best discuss players noticed her talent and offered to become her personal coach. “The potential in her is what prompted me into contributing towards nurturing her talent and so far, I am pleased with her progress,” Stated Metet. The player/coach team is based in Laikipia but is currently training in Nyeri. 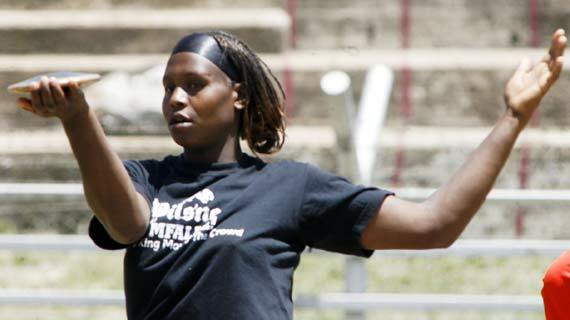 In December 2011, Rakamba made her debut appearance during the Athletics meeting held in Mombasa where she finished 1st after registering a 41-metre throw. During the buildup event on Wednesday last week, the young discus thrower poised a threat to other competitors in the Discuss competition despite the fact that she was the youngest participant. Out of the 8 round event, Rakamba registered a 40.96m throw in one of the attempts making her the winner of the pre-season competition. However, she is yet to hit her personal best mark of 42.50 which she recorded in one of the events last year. Indeed, Rakamba has much to learn under the leadership of player/coach Richard Metet. Metet has 17 yrs of experience and during the 2010 African senior athletics championships held in Nairobi, he managed to finish 4th in the discus competition. Both players are aiming at earning slots to the 2012 London Olympics. “It will be a great honor if both of us earn slots in the London Olympics. That will be a great milestone for both us and the Country at large,” explained Metet. Meanwhile, the two will participate in the athletics meetings series scheduled to kick off in March through to July. The 1st meeting will be held in Kisumu in February. Other notable discus players in the women category include Everlyn Kipruto, Neddy Kilimo, Felister Bosire and Margaret Mumbi.